It’s CGI dinosaur time when Primeval premieres soon on Nine. Last year Nine did very nicely, thankyou with Prehistoric Park, a very silly mish-mash of drama and natural history. Watching a palaeontologist deliver David Attenborough history lessons was one thing, but trying to structure it in a fantasy drama was a stretch of light years proportions. Primeval is thankfully clearer in its genre. This is an unabashed family adventure stuff. Nobody is trying to pass this off as a nature series, and nor should they. The central characters of this latest UK foray are a wide-eyed teenage boy, a British zoologist and his attractive female assistant. When the boy finds a supposedly extinct lizard in a forest, the team set-up solving what is presumably a great mystery. I’m sure it’s greater if you are actually there than when you’re watching on the box, unless of course you are a kid at heart. Primeval doesn’t pitch itself very high. There’s more emphasis on the adventure than character, most of whom I expect will be fairly extinct themselves soon enough. Broadly delivered, it doesn’t aim for any of the attitude of a fantasy like Doctor Who. The explanation for the appearance of the weekly dinosaurs in the forest is a “rip in time.” Funny how the rip in time didn’t emerge at the local 7-11, but so be it. As the latest of Nine’s 2007 pre-promoted series to be unveiled it’s a bit of a disappointment, really. But at least the network isn’t trying to pass this off as anything more than family fun. Programmed on a Saturday night is indicative that this is fare for a younger crowd. 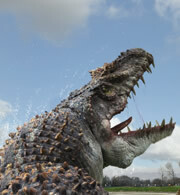 The CGI breakthrough of Walking with Dinosaurs is yet to prove it has any other dramatic use than in documentary form. Several years on, I’m still waiting for intelligent life. Primeval premieres 7:30pm Saturday April 28 on Nine. Is series 4 gonna show on TV, even though the other 2 didnt? It played last April -no.